The day dawns damp and gets damper as we join an impressively long queue to get into the car park at Holme Pierrepoint. I don’t recall anyone ever having charged for car parking at Holme Pierrepoint before and we have been here dozens of times but they are charging £5 to park, which has manufactured the queue. As start time approaches I jump out of the car and leave L to park up, just in case they don’t delay the start but sensibly, they do. Now I have the problem of having excess clothes to dump which I hide behind one of the porta cabins in front of the main buildings. Question: What’s worse than one laps of the rowing strip at Holme Pierrepoint? Question: What’s worse than two laps of the rowing strip at Holme Pierrepoint? Answer: Two laps in driving wind and heavy rain. Yes, it’s not pleasant but then the omens have never been good for this race right from the moment they sent me my race number ‘666’. My time is unsurprisingly unimpressive but it’s only training. Isn't it? The bonus is that despite the inclement conditions nothing snaps. Afterwards we head to Wetherspoons in Beeston for a bacon roll and a hot coffee to warm up. My dedicated supporters are as wet and cold as I am. Then L’s at Puregym where she doesn’t relish having to put wet clothes back on afterwards. She best get herself home as quickly as possible and get them off again. In the evening we’re back at Broadway. It is 1947 and Lord Mountbatten (Hugh Bonneville) has been sent to Delhi as the last Viceroy of India with the task of handing India back to its people within twelve months. After 300 years, British rule is coming to a close. 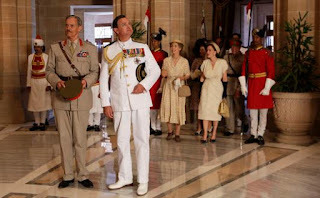 The story takes place mainly inside the walls of the Viceroy's House where ‘Dickie’ Mountbatten resides with his wife Edwina (Gillian Anderson) and daughter Lady Pamela (Lily Travers) along with their many many Hindu, Muslim and Sikh servants. The political elite, namely Nehru (Tanveer Ghani) of the Indian Congress, Jinnah (Denzil Smith) of the Muslim League, Mahatma Gandhi (Neeraj Kabi) the revered leader of the independence movement and others, all visit the House for meetings as they wrangle over the terms of independence whilst in the country as a whole riots erupt. 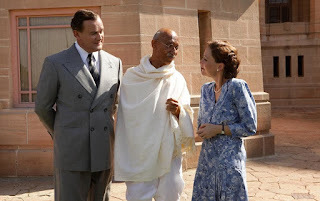 Gandhi, Nehru and Mountbatten (initially) all wanted a single nation of two faiths but the London Government, for its own political reasons, preferred to partition the country along religious lines. Namely to create a new Muslim nation of Pakistan with a downsized India populated mostly by Hindus. It was this ‘Mountbatten Plan’ that was eventually agreed and with the British army too war weary to cope with the continued rioting, Mountbatten advanced the date for the transfer of power by six months. The actual border for partition was decided by a London barrister called Cyril Radcliffe (Simon Callow) but what Mountbatten didn't know, was that he had been well and truly stitched up by London. The whole partition plan had already been put together years ago by Winston Churchill and he was simply sent there as the fall guy to deliver it. Partition led to the uprooting of 14 million people and millions more were killed in the resulting turmoil. Real newspaper headlines and archive footage give weight to the story creating an educating docu-drama. The Mountbattens to their credit stay on in India to try to help in any way they could while the consequences of partition still reverberate to this day, seven decades later. Sadly, to give the film a bit more general appeal, there is also a love story between a Hindu servant Jeet (Manish Dayal) and his intended Muslim bride Aalia (Huma Qureshi). They quickly find themselves in conflict with their own communities. This diversion is a shame, as it takes screen time away from the main story and leaves the film perhaps not as punchy as it could have been. 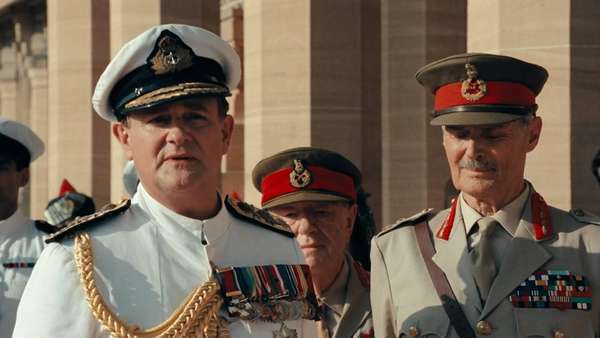 That said, the film is still a fascinating watch about an important piece of post-war history albeit mainly from the British perspective. 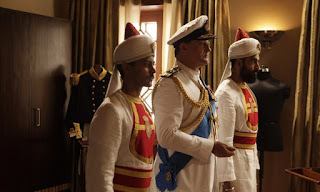 The film is directed by Gurinder Chadha whose own family were caught up in the events that unfolded. We eat in Broadway after the film, that is when they remember us. It takes the consumption of three Leffe Brunes until they finally serve us despite the place being almost empty. At least one of them is a freebie for the delay. This doesn’t leave us enough time to get to the pubs on Canning Circus so we nip into the new Six Barrel Drafthouse for the second time but again we don’t stay, not being impressed by the offering and we end up in Major Oak for a Titanic Stout instead.